Today is the vernal equinox, the first official day of spring. Soon we shall begin to observe those hallmark sights and sounds of spring, the welcome return of many iconic plant and animal species. While we typically celebrate spring as a period of rejuvenation, it is also a perilous time for many species. Amphibians are only just beginning to emerge from their overwintering sites, and yet they will experience a diversity of threats almost immediately. Adult barred tiger salamander (Ambystoma mavortium) crawling through the leaf litter. Amphibian eggs are surrounded by a gelatinous covering that provide some protection, but cannot protect against desiccation if they are not deposited in water, or in a cool damp area. Many species of amphibians breed in wetlands separate from their over wintering sites, requiring them to make an annual trek from their over wintering sites to their breeding wetlands. These mass movements of amphibians typically occur on relatively warm, damp nights, and may require individuals to cross one or more roads that fragment their habitat. Amphibians are relatively small, slow moving, difficult to see against a road surface, and are unaware of how to behave intelligently towards traffic (i.e. avoid it). Estimates of road mortality vary greatly depending on the characteristics of the road, and the intensity of traffic, however some studies have estimated mortality rates as high as 75-98% for certain meta-populations near roads with high traffic intensity. The implementation of road warning signs, blocking certain roads during breeding season, and construction of wildlife underpasses have served to mitigate road mortality, however their implementation is typically limited to high risk areas. Driver education, and a willingness to practice safe driving practices may serve to reduce incidents of amphibian road mortality. In regions of Canada where road salt is applied during the winter, amphibians face additional risks. Salt applied to roads often arrives in roadside ponds through run-off, which can in turn increase chloride concentrations of these wetlands. This can exclude some species from occupying these ponds, and/or may be lethal to developing larval amphibians. A male wood frog (Lithobates sylvaticus) calls from the surface of a shallow pool in a normally dry pasture in Prince Albert, SK, May 2011. One of those characteristic sounds of spring is that of frog/toad choruses emanating from vernal pools, and ponds. 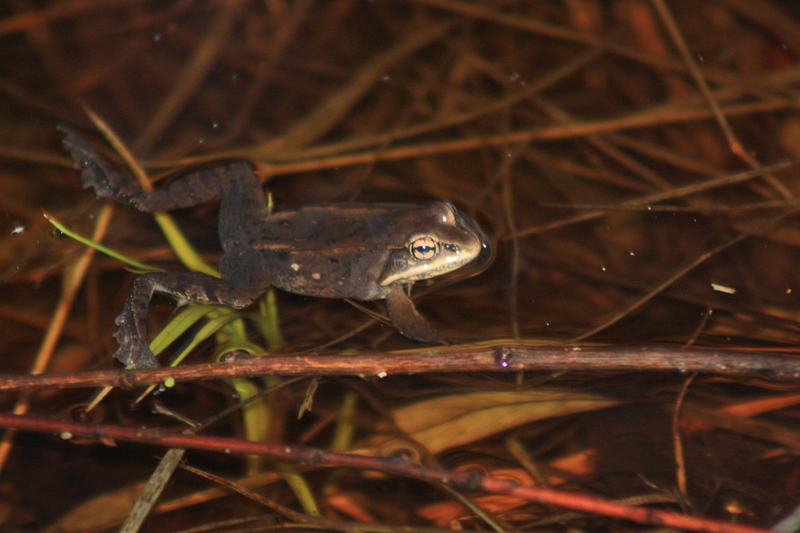 Since suitable wetlands for breeding are limited, adult amphibians typically congregate in large numbers within suitable ponds in order to breed. Numerous different species will often co-occupy and breed in the same pond. Once breeding has completed, adults of many species will disperse, and the wetland will be stocked with large numbers of amphibian larvae who will continue to develop in these ponds until metamorphosis. After completing metamorphosis the juvenile amphibians will emerge from their natal ponds, and then they too will disperse. These congregations of amphibians represent the perfect opportunity for the transmission of disease. Although the spread of disease is perfectly natural, the recent emergence of highly virulent novel pathogens has had a profoundly negative impact upon many species of amphibians in North America. Outbreaks of ranaviruses have been observed to cause massive die-offs of larval amphibians, in some instances resulting in > 98% mortality within contaminated wetlands. Infection typically occurs through direct contact, ingestion of the virus, or exposure to contaminated water or sediment. Ranaviruses can be transmitted among wetlands by humans and animals transporting sediment or other contaminated materials among wetlands, and also by individual amphibians carrying a sub-lethal transmissible infection. Chytridiomycosis is an infection of amphibians caused by the fungus Batrachochytridium dendrobatidis (also known as Bd). Bd uses the aquatic environment to disperse its mobile zoospores and infect new hosts. This makes breeding wetlands the perfect location for transmission of the disease, and a particularly harmful situation for amphibians. Chytridiomycosis is highly pathogenic and is believed to be responsible for the catastrophic decline or extinction of over 200 species worldwide in the past 30 years. Mortality is dependent upon severity of infection and the species effected. 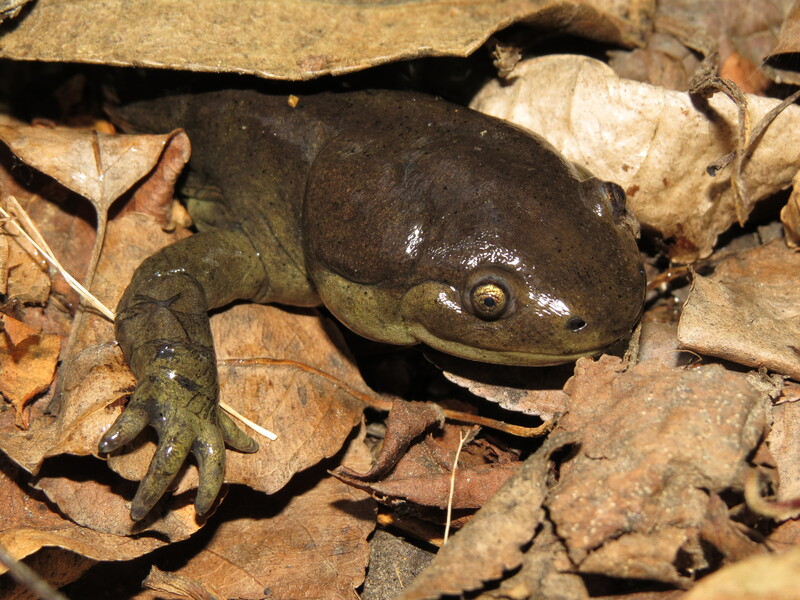 Some species appear to exhibit resistance to infection, such as the bull frog (Lithobates catesbeianus) and the African clawed frog (Xenopus laevis) but may still act as carriers of the disease. Species vulnerable to the disease may also be carriers of the disease if they attain a sub-lethal infection. Recently a second species of Batrachochytridium has begun to appear in salamanders through the pet trade, Batrachochytridium salamandrivorans (also known as BSal). While this disease has not yet been observed in wild populations in North America, it has caused dramatic in affected salamander populations in Europe. However, if introduced to North America BSal would very likely have similarly catastrophic results. 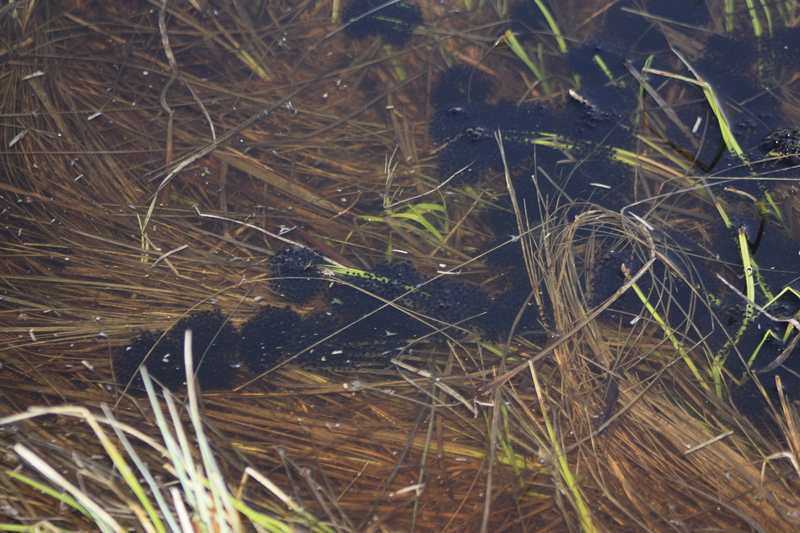 Multiple clutches of wood frog eggs attached to submerged vegetation of a shallow pool in a normally dry pasture in Prince Albert, SK, May 2011. Amphibians are currently experiencing global population declines. This is due in large part to habitat loss and fragmentation, climate change, pollution, emerging diseases, introduced species, and exploitation of species for trade. Please take the time today to consider the perils facing these iconic harbingers of spring, and help us ensure their preservation for the future. The CWHC is involved in monitoring and raising awareness of amphibian disease, and conducts opportunistic testing of amphibians suspected of carrying infection. If you observe dead amphibians in the wild, or observe signs of illness in wild or captive amphibians please contact the CWHC National Information Line: 1-306-966-5099. Article and photos contributed by Dr. Dale Jefferson, Data and Communications Officer CWHC National Office.